Hurricanes & climate change: 21st century projections | Climate Etc. Final installment in my series on hurricanes and climate change. The effect of climate change on hurricanes has been a controversial scientific issue for the past several decades. Improvements in the capabilities of climate models, the main tool used to predict future climate, have enabled more credible simulation of the present-day climatology of hurricanes (Walsh et al 2016). The increasing ability of climate models to predict the interannual variability of hurricanes in various regions of the globe indicates that they are capturing some of the essential physical relationships governing the links between climate and hurricanes. This Chapter addresses climate model projections of hurricane activity out to 2100, in response to manmade global warming. Also addressed is the role of natural modes of climate variability in influencing hurricane activity out to 2050. Apart from the difficulty of simulating hurricane activity in climate models; there is substantial uncertainty associated with climate model projections of 21st century climate change, including the changes in sea surface temperatures and ocean and atmospheric circulation patterns that would cause any changes in hurricane activity. Curry (2018a; Sections 5.1, 5.6) provides an analysis of these uncertainties; a summary of that analysis is provided here. The climate model simulations of 21st century climate referenced in the IPCC AR5 are based on more than 30 different global climate models from international climate modeling groups. The climate models simulate changes based on a set of scenarios of manmade forcings from changing atmospheric composition, primarily from fossil fuel emissions. ‘Radiative forcing’ is the difference between insolation (sunlight) absorbed by the Earth and the energy radiated by the Earth and its atmosphere back to space. Radiative forcings are influences that cause changes to Earth’s climate system by altering the Earth’s radiative equilibrium, forcing temperatures to rise or fall. A new set of emissions scenarios, the Representative Concentration Pathways (RCPs), was used for the climate model simulations in the IPCC AR5. In all RCPs, atmospheric CO2 concentrations are higher in 2100 relative to present day as a result of a further increase of cumulative emissions of CO2 to the atmosphere during the 21st century. The four RCPs are named according to radiative forcing target level for 2100. The radiative forcing estimates are based on the forcing of greenhouse gases and other forcing agents. The four selected RCPs include one mitigation scenario that leads to a very low forcing level (RCP2.6), two medium stabilization scenarios (RCP4.5/RCP6) and one very high emission scenario (RCP8.5). RCP8.5 is sometimes referred to as a ‘business as usual’ scenario. It is not. Rather, it is an extreme scenario that may be impossible. Ritchie and Dowlatabadi (2017) recommend that RCP8.5 should not be used as a benchmark for future scientific research or policy studies. 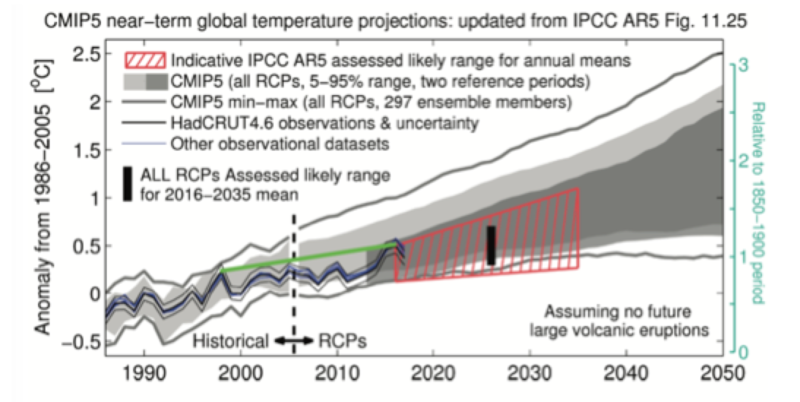 Table 7.1 summarizes the IPCC AR5 temperature and sea level rise projections for 2046-2065 and 2081-2100. Eliminating RCP8.5 from further consideration here, the likely range of temperature increase by the end of the 21st century is 0.3 to 3.1oC [0.5 to 5.5oF]. Figure 7.2 provides an update of Figure 11.25 from the IPCC AR5. It is seen that the observed temperatures between 2000-2012 are at the bottom of the envelope of climate model simulations (this period is often referred to as the ‘warming hiatus’). The red hatching in Fig. 11.25 (Figure 5.2) reflects the judgment by the AR5 authors that lowers the projected warming out to 2035 relative to the climate model simulations. The large El Niño of 2016 has returned the observed temperature curve to near the middle of the envelope of climate model simulations; however the previous large El Niño of 1998 was at the top of the envelope of climate model simulations. The recent data since 2012 continues to indicate that the sensitivity of at least some of the climate models to CO2 forcing is too high. Figure 7.2 Synthesis of near-term projections of global mean surface air temperature anomalies. Projections from climate models showing the 5 to 95% range using a reference period of 1986–2005 (light grey shade). The maximum and minimum values from climate models using all ensemble members and the 1986–2005 reference period are shown by the grey lines. Black lines show annual mean observational estimates. The red-hatched region shows the indicative likely range for annual mean GMST during the period 2016–2035. [following IPCC AR5 WG I Figure 11.25; updated by Hawkins 2018]. Added green line between 1998 and 2016 reflects the trend between two strong El Niño years. A key issue is the uncertainty of sensitivity of climate models to CO2. The equilibrium climate sensitivity (ECS) is a measure of the climate system response to sustained radiative forcing, defined as the amount of warming in response to a doubling of atmospheric CO2. At the heart of the uncertainty surrounding the values of ECS is the substantial difference between values derived from global climate models versus values derived from changes over the historical instrumental data record using global energy budget analyses. The median ECS given in IPCC AR5 for global climate models was 3.2 oC, versus 2.0 oC for the median values from historical-period energy budget based studies. Subsequent to the IPCC AR5, Lewis and Curry (2015) used an observationally-based energy budget methodology with the AR5’s global forcing and heat content estimate time series to derive a median ECS estimate of 1.6 oC, which makes the discrepancy with global climate models even larger. A recent update by Lewis and Curry (2018) with more recent data concluded that high estimates of ECS derived from a majority of global climate models are statistically inconsistent with observed warming during the historical period. Lewis and Curry further concluded that the observationally-constrained values of ECS imply 21st century warming under increased CO2 forcing of only 55-70% of the mean warming simulated by global climate models. The scenarios of future climate are incomplete, focusing only on emissions. Emissions follow the specified concentration pathways (RCP). Climate models accurately predict the amount of warming in 21st century. 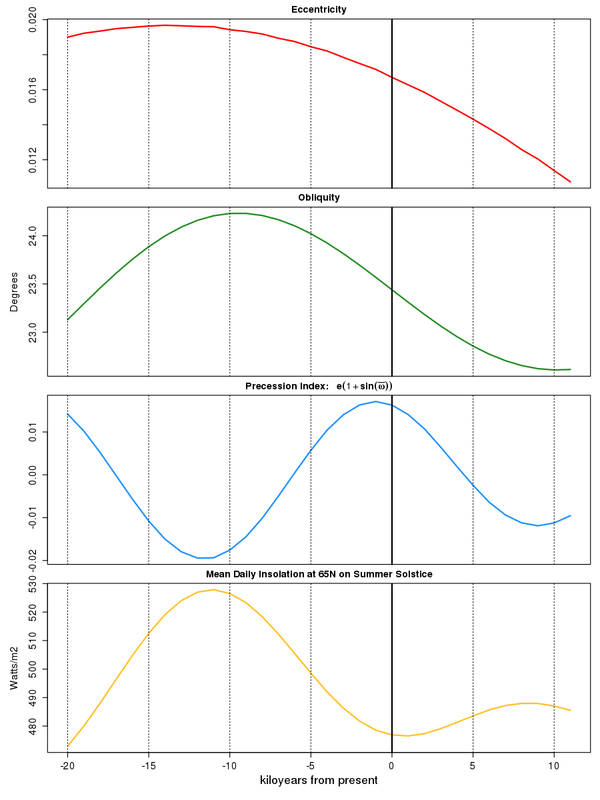 Solar variability follows that of the late 20th century, which coincided with a Grand Solar Maximum. Natural internal variability of ocean circulations does not impact temperature or sea level rise on these timescales. Major volcanic eruptions are not considered. Each of these contingent assumptions, with the possible exception of natural internal variability, likely contributes to a warm bias in the 21st century climate model projections. Potential Intensity theory leads to the expectation of increased intensity. Hurricanes are expected to produce more rainfall. No particular rationale for an increase or decrease in the number of hurricanes. An understanding of how and why hurricanes change with a changing climate. As summarized in Chapter 4, our understanding of how and why hurricanes change in a changing climate is incomplete, with qualitative understanding based on analysis of limited observations and theoretical understanding. At best, climate model-based projections of future hurricane activity are contingent on the predicted amount of warming. The IPCC AR5 provided a synthesis of global and regional model-based projections of future hurricane climatology by 2081 – 2100 relative to 2000 – 2019. Globally, their consensus projection is for decreases in hurricane numbers by approximately 5 – 30%, increases in the frequency of categories 4 and 5 storms by 0 – 25%, an increase of 0 – 5% in typical lifetime maximum intensity, and increases in rainfall rate by 5 – 20%. A summary of research since the IPCC AR5 is provided by the NCA4 (2017), whereby some studies have provided additional support for the AR5 conclusions, and some have challenged aspects of it. In the end, the NCA4 conclusions were identical to the IPCC AR5 conclusions cited above. As summarized by Walsh et al. (2016), at present there is no climate theory that can predict the formation rate of tropical cyclones from the mean climate state. It has been known for many years that there are certain atmospheric conditions that either promote or inhibit the formation of tropical cyclones, but so far an ability to relate these quantitatively to mean rates of tropical cyclone formation has not been achieved, other than by statistical means through the use of empirically-based genesis potential indices (e.g. Menkes et al. 2012). An important test of climate model predictions of future hurricane frequency is whether the climate models can simulate the present hurricane climatology. Simulation of the climatological number of Atlantic hurricanes is particularly difficult. Most climate models predict a decrease in the global number of hurricanes by 2100. Explanations of this decrease are linked to reduced relative humidity in the mid-levels of the atmosphere and reduced upward rising motion in hurricane formation regions. Not all methods for determining hurricane numbers identify a decrease in future numbers, however. Emanuel (2013) uses a downscaling method in which incipient tropical vortices are “seeded” into large-scale climate conditions provided from a number of different climate models for current and future climate conditions. Emanuel’s approach generates more hurricanes in a warmer world when forced with the output of climate models. While most models predict fewer tropical cyclones globally in a warmer world, the difference in the predictions among different climate models becomes more significant when smaller regions of the globe are considered. This appears to be a particular issue in the Atlantic basin, where climate model performance has been often poorer than in other oceanic regions. The issue as to whether the number of hurricanes will change in a warmer climate remains unresolved. Using millennia-long climate model simulations, Lavender et al. (2018) examined whether the record number of tropical cyclones in the 2005 Atlantic season is close to the maximum possible number for the present climate of that basin. By estimating both the mean number of hurricanes and their possible year-to-year random variability, they found that the likelihood that the maximum number of storms in the Atlantic could be greater than the number of events observed during the 2005 season is less than 3.5%. Hence, the 2005 season can be used as a risk management benchmark for the maximum possible number of tropical cyclones in the Atlantic. Using the GFDL hurricane modeling system, Knutson et al. (2015) found that projected median hurricane size is found to remain nearly constant globally, with increases in most basins offset by decreases in the northwest Pacific. Changes in surface and subsurface ocean conditions can both influence a hurricane’s intensification. Huang et al. (2014) suggest a suppressive effect of subsurface oceans on the intensification of future hurricanes. Under global warming, the subsurface vertical temperature profile may contribute to a stronger ocean cooling effect during the intensification of future hurricanes. Emanuel (2015) estimated that the effect of such increased upper ocean stratification is relatively small, reducing the projected intensification of hurricanes by only about 10%–15%. would not be expected for a number of decades, even assuming a large underlying increasing trend (+10% per decade). An increase in rainfall from hurricanes in a warmer climate is a consistent finding from climate model simulations. As summarized by GFDL (2018), hurricane rainfall rates will likely increase in the future due to manmade global warming and the accompanying increase in atmospheric moisture content. Modeling studies on average project an increase on the order of 10-15% for rainfall rates averaged within about 100 km of the storm for a 2oC [4oF] global warming scenario. Climate-model based projections of future hurricane activity have focused on the impacts of manmade climate change. It is of substantial interest to understand how hurricane activity might vary on timescales out to 2050, associated with the known modes of interannual and decadal variability in specific ocean basins. The evolution of the climate on decadal time scales is the combined result of an externally forced component – due to greenhouse gases, aerosols and natural radiative forcing agents – and natural internal variability of the climate system. A decadal climate prediction attempts to simultaneously forecast the evolution of both of these components over the next few decades. The next generation of the DCPP simulations is described by Boer et al. (2016), for the CMIP6 and the forthcoming IPCC AR6 Report. At this point, the climate models, even when the oceans are initialized with current observations, do not have any prediction skill beyond a decade at most. The biggest challenge is predicting shifts in the Atlantic and Pacific patterns of decadal variability (e.g. AMO, PDO). Given the challenges associated with climate model predictions on decadal scales, an alternative approach is to consider possible future scenarios of the indices of decadal climate variability and shifts in the multidecadal indices such as the AMO and PDO. Section 4.3 described the natural internal modes of variability, including the Atlantic Multidecadal Oscillation (AMO), North Atlantic Oscillation (NAO), Atlantic Multidecadal Mode (AMM), Pacific Decadal Oscillation (PDO) and the North Pacific Gyre Oscillation (NPGO). Among these modes, a forthcoming shift in the phase of the AMO (away from the current warm phase to the cool phase; Figures 4.4, 4.5) would have the greatest impact on Atlantic hurricanes (Figure 4.6). Frajka-Williams et al. (2017) report a decline in the AMO index since 2013. The timing of a shift to the AMO cold phase is not predictable; it depends to some extent on unpredictable weather variability. However, analysis of historical and paleoclimatic records suggest that a transition to the cold phase is expected prior to 2050. Enfield and Cid-Serrano (2006) used paleoclimate reconstructions of the AMO to develop a probabilistic projection of the next AMO shift. Figure 7.3 shows the probability of an AMO shift relative to the number of years since the last regime shift. The previous regime shift occurred in 1995; hence in 2019, it has been 24 years since the previous shift. 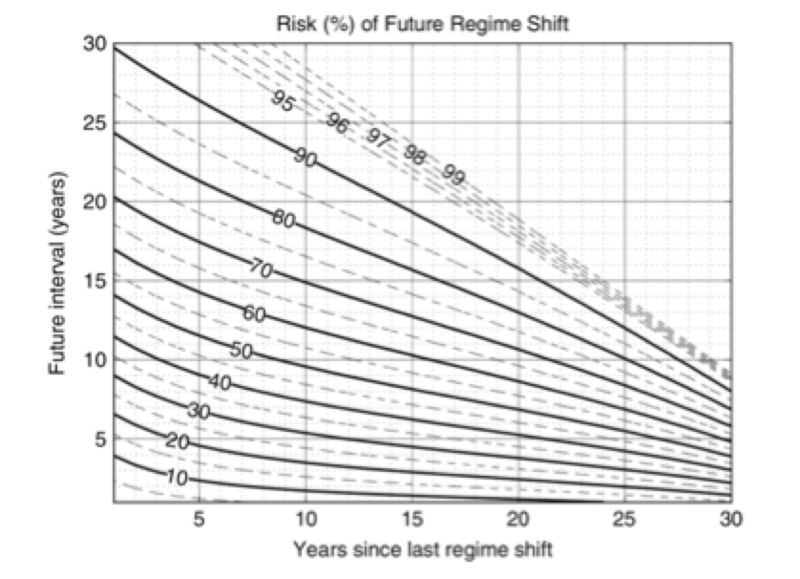 Figure 7.3 indicates that a shift to the cold phase should occur within the next 15 years, with a 50% probability of the shift occurring in the next 7 years. Atlantic hurricane statistics for the period to 2050 depend not only on the timing of a shift of the AMO to the cool phase, but also on the variability of the other climate indices. Caron et al. (2014) found that while some influences, such as ENSO, remain present regardless of the AMO phase, other climate factors show an influence during only one of the two phases. During the negative phase, Sahel precipitation and the NAO play a role, while during the positive phase, the 11-year solar cycle and dust concentration over the Atlantic appear to be more important. Lim et al. (2016) showed that the NAO and AMM can strongly modify and even oppose the well-known ENSO impacts. While the predictability of these modes is limited to seasons rather than years, the statistics of combinations of these indices provides useful information regarding the interannual variability within the decadal time horizon. Of particular interest is the frequency of occurrence of years of extremely high or low hurricane activity. Patricola et al. (2014) investigated the possible effects of combinations of extreme phases of the AMM and ENSO. Individually, the negative AMM phase and El Nino each inhibit Atlantic hurricanes, and vice versa. Simultaneous strong El Nino and strongly positive AMM, as well as strong concurrent La Nina and negative AMM, produce near-average Atlantic ACE, suggesting compensation between the two influences. Strong La Nina and strongly positive AMM together produce extremely intense Atlantic hurricane activity, while strong El Nino and negative AMM together are not necessary conditions for significantly reduced Atlantic tropical cyclone activity. The past decade or so has seen a preponderance of El Nino events (relative to La Nina). The PDO has been weakly negative for the past year, following a period since 2014 of mostly positive values. Presumably, at some point in the next 30 years, we can expect a period when La Nina events dominate. The general probabilistic approach used by Enfield and Cid-Serrano (2006) seems promising for developing probabilities of regime combinations, which can then be related to Atlantic hurricane activity via historical relationships with these regime indices. However, the possibility of data-driven climate dynamics-based probabilistic predictions and scenarios of decadal scale hurricane activity is largely untapped. Increased rainfall rates can also be expected in a warmer climate (Section 7.2.3). There is no evidence of increasing hurricane size, which influences storm surge, rainfall amounts and the number of tornadoes (Section 4.5). If climate model projections of fewer hurricanes but a greater percentage of Category 4 and 5 storms are correct, the tradeoff between these two competing effects on overall landfall impacts is not straightforward. The statistics of rare Category 4 and 5 landfalling events are much more volatile than basin-wide hurricane metrics. Emanuel (2011) estimated the time of emergence of global warming effects on U.S. hurricane damage. Using a recently developed hurricane synthesizer driven by outputs from global climate models, 1000 artificial 100-yr time series of Atlantic hurricanes that make landfall along the U.S. Gulf and East Coasts were generated for four climate models and for current climate conditions as well as for the warmer climate circa 2100. These synthetic hurricanes produce damage to a portfolio of insured property according to an aggregate wind-damage function; damage from flooding was not considered. Three of the four climate models used produced increasing damage with time, with the global warming signal emerging on time scales of 40, 113, and 170 years. For the fourth climate model, damages decreased with time, but the signal was weak. Substantial advances have been made in recent years in the ability of climate models to simulate the variability of hurricanes. However, inconsistent hurricane projections emerge from modeling studies due to different down-scaling methodologies and warming scenarios, inconsistencies in projected changes of large-scale conditions, and differences in model physics and tracking algorithms. Systematic numerical modeling experiments organized under the auspices of the Hurricane Working Group of the U.S. CLIVAR Program (Walsh et al. 2015) were designed to coordinate efforts to produce a set of model experiments designed to improve understanding of the variability of tropical cyclone formation in climate models. Progress continues to be made, particularly with models that are coupled to the ocean. Apart from the challenges of simulating hurricanes in climate models, the amount of warming projected for the 21st century is associated with deep uncertainty. Hence, any projection of future hurricane activity is contingent on the amount of predicted global warming being correct. Recent assessment reports have concluded that there is low confidence in future changes to hurricane activity, with the greatest confidence associated with an increase in hurricane-induced rainfall and sea level rise that will impact the magnitude of future storm surges. Any projected change in hurricane activity is expected to be small relative to the magnitude of interannual and decadal variability in hurricane activity, and is at least several decades away from being detected. Decadal variability of hurricane activity over the next several decades could provide much greater variability than the signal from global warming over the next century. In particular, a shift to the cold phase of Atlantic Multidecadal Oscillation (AMO) is anticipated within the next 15 years. All other things being equal (such as the frequency of El Nino and La Nina events), the cold phase of AMO harkens reduced Atlantic hurricane activity and fewer landfalls for Florida, the east coast and the Caribbean. This entry was posted in Hurricanes. Bookmark the permalink. ice ages, including the little ice age are caused by ice. ice advance is caused by volume and weight of ice in cold places where ice advances to cause colder and ice ages. snowfall results when the polar oceans are warm and thawed, The news reports that is happening every day now and for some time back this winter. This posting does not contain anything about warm evaporated oceans and increased snowfall in cold places, this counters warming and sea level rise. Increased rainfall was mentioned but no mention of snow or ice. That part of this story is totally lacking. ice causes ice ages and the most snowfall is in the warmest times when oceans are more thawed. Ice core data proves this is true. You only use model output for projections for many years ahead and do not refer to ice core data. You have data that shows what happened in the past and do not use it. That is not good science to ignore data and only use flawed model output. Data shows that past cycles occurred without man made CO2, we are inside the bounds of past climate, all data indicates the cycles are internal natural cycles that we did not cause, cannot cause and cannot stop. CO2 is higher but temperature is not. We warmed out of the little ice age because every cold period in the past fifty million years ended by warming into to a warm period. The current warm period is normal, natural, necessary to rebuild ice that is sequestered in cold places and unstoppable. Understand what is happening and why before you try to stop something you do not even begin to understand. You repeat this again and it simply doesn’t add anything to the discussion. It is moreover simplistically wrong. Glacials transitions are linked to Arctic Ocean freshening and AMOC decline in the context of low NH insolation leading to runaway ice sheet feedbacks. How close are we to a hot or cold climate tipping point? 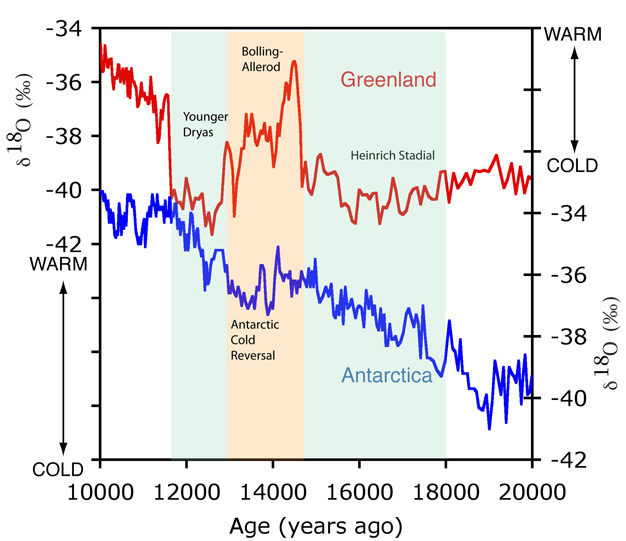 Easy question, ice core data shows the Roman and Medieval warm periods lasted a few hundred years and then the increased snowfall and ice sequestering caused ice advance and caused cold periods. This warm period will last a few hundred more years and we will cool into another little ice age. 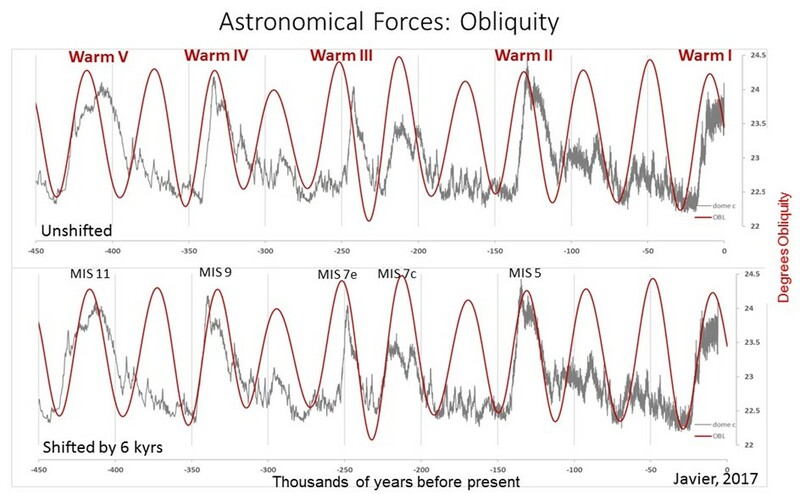 These oceans cycles happen in warm periods and cold periods and do cause changes but only more ice can cause and ice age and only depleted ice causes warm periods. The other stuff matters but in a smaller way. This is simplistically right. Ice core data proves it to have been true for 800 thousand years and nothing has changed that. Warmer oceans will support more evaporation and snowfall and CO2 does not change the temperature that polar sea ice thaws and increases the evaporation and snowfall. All the stuff that you talk about proving me wrong is natural normal and a natural part of the natural cycles. You have not proved natural factors stopped causing the natural, normal necessary and unstoppable climate change. What caused the cycles of the last ten thousand years that suddenly stopped? The important data is still inside historic bounds of the past ten thousand years. 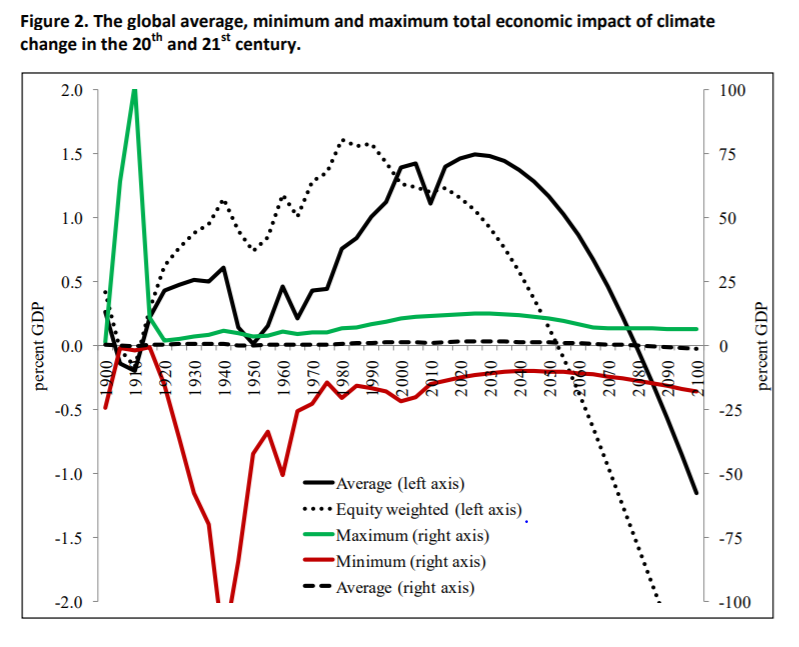 Hockey stick alarmism requires removing past warm periods from history. I read the history and looked at the data that has not been changed yet. Past warm periods really did happen and the peak warm times were warmer than now. You oppose this with words that mean nothing over and over again. propose your theory, I really can not read your writing and figure out what you believe in, only that you are against stuff. Have you written and posted what you really believe causes natural climate change? It is again off topic – and wrong. And nothing I have ever said posits that internal variability has stopped. Then why do you propose that natural variability is not significant? 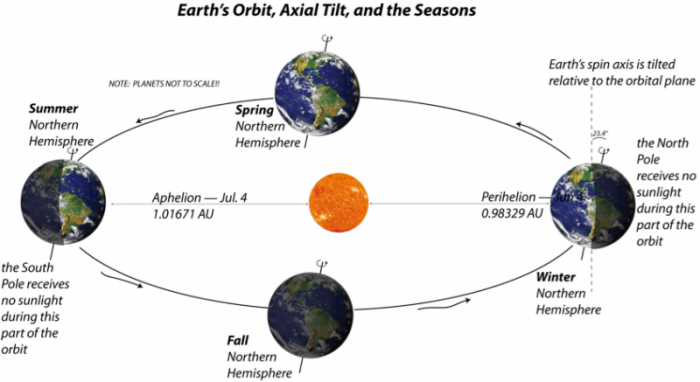 Why do you ask how close we are to a hot or cold tipping point? Why do you think future climate will not repeat the climate of the very well regulated climate of the past ten thousand years? These are simple questions and you avoid answering them. This is the topic. There is a discussion towards the end of the week in review – where your perpetual narrative would be better placed. Even if you have said it there several times already. I am trying hard to avoid distracting from cyclones in the 21st century – and my Igor Polyakov quote on the 21st century Arctic is relevant to the topic. Many people understand what I Write. It snows more when oceans are warm and thawed and more ice advances and causes colder. It snows less when the oceans are cold and frozen and ice depletes and ice retreats and causes warmer. I have studied climate for over ten years and I have no clue as to what you alarmist words mean and how that can bring us close to a tipping point. Ice ages are caused by ice and ice is caused by snowfall and snowfall comes from moisture the evaporated when oceans were warm and thawed. You have nothing that proves this wrong but you have words that attack this theory. We are warm now and a few hundred years of more snowfall will cause another little ice age. What has happened will repeat. I respond to posts, if there is a better place to respond, please send me links. I promote study of causes of natural climate change and using ice core data and other data and history to understand this. Climate has changed with changes in internal natural cycles and those are not studied or understood. At Robert Ellison, you wrote There is a discussion towards the end of the week in review – where your perpetual narrative would be better placed. There is not a better place or time for a response for anything important than in response to a most recent posting by anyone on Dr Judy Curry’s Climate etc. You give me lots of wrong theory to shoot at. By analogy to past interglacials and climate cycles, we are 1500-2500 years from glacial inception, that will irreversibly commit the climate towards a glacial period of about 65,000 years. The Neoglacial trend has been of –0.2°C/millenium. At glacial inception the cooling rate doubles through the recruitment of feedbacks, mainly ice-albedo and vegetation feedbacks. No rising insolation or rising obliquity can stop it and in 26,000 years eccentricity will be close to zero, promoting ice build-up through the next high insolation and high obliquity periods. Check the figures here: https://wattsupwiththat.com/2017/08/04/paleoclimate-cycles-are-key-analogs-for-present-day-holocene-warm-period/ Its ‘ratcheting’ all the way down. It’s like they miss geophysics entirely. RI Ellison’s link mentions ‘Bipolar Seesaw’. However this other site https://climatechange.umaine.edu/gisp2/data/bender.html comparing Gisp2 and Vostok show close correlation. A problem of synchronizing cores chono-wise?? The first data on ice-core available to me was Wiki’s Dragons Flight ‘Holocene temp var’, that showed Vostok and Kilimanjaro concurrent at sudden temp rise at end of YD., but with Gisp2 lagging 1100 years behind. ???? That when there is evidence from volcanic eruptions, that global events effect everywhere within a year. See https://rmets.onlinelibrary.wiley.com/doi/pdf/10.1002/joc.891 that says ” Rhyolitic-composition (SiO2≈70 wt%; Na2O+K2O≈8wt%)glass shards have been filtered out of the acid horizon from Greenland and South Pole cores”. Now Quelccaya research here https://kb.osu.edu/bitstream/handle/1811/80465/1/StahlHenry_thesis.pdf , in abstract, says “At this location, plant samples were preserved in-situ beneath the advancing glacial ice, and since 2004 have been collected as the ice retreats. —- Therefore, the advancement seen at the North Lake Lobe of the Quelccaya Ice Cap is another indicator of cooling regional temperatures in South America during the mid-Holocene.” But note the dates, and note that Quelccaya at lat is ~14deg, well within today’s tropic (and possibly at tropic pre the two given dates, so the abrupt cooling effect is max). Much of the variability in both hemispheres is internal variability in a complex dynamical system. Judith, I learned much from the series. Thank you. Climate change projections for the 21st century are only as valid as the climate model simulations upon which they are based. Climate models have proved to be worse than useless. My climate change projections for the next century are as valid as our past data and how well the future repeats the past. Warm periods in the last ten thousand years have lasted a few hundred years while thawed oceans did provide more evaporation and snowfall to rebuild sequestered ice. That is happening now, watch the news every night to see and hear about the massive snowfalls. Ice is being sequestered on Greenland and other cold places. That ice will advance and cause colder after it rebuilds for a few more hundred years. This is how ice cycles work. Use past data and not flawed model projections. There is not one that works right yet. Maybe someday, when you understand the ice cycles, you will be able to fix the models. There is little or no hope for that now, or in the near future or even in the distant future. History repeats and without understanding what causes what, we can be sure the what has happened will happen again because that has happened in the same bounds for ten thousand years will happen again and we did not cause it and can not stop it..
CERES gives us an explicit observation based way to evaluate “radiative forcing”. It is generally agreed that there has been an increase in surface temperature (absorbed by the earth) over the CERES period of record. This increase accords with the green curve of net radiation to space, which decreases over the period. However, when the component wavelengths of solar (SW) and earth (LW) radiance to space are separated, it can be seen that earth (LW) radiation has increased slightly, and that the net decrease is solely attributable to the decrease in reflected solar SW. The inescapable conclusion must be that the radiative forcing over the CERES record resulted from increased insolation absorbed by the earth and not from decreased LW radiation to space anticipated from human greenhouse gasses. Not that black and white. AGW is happening but any imbalance depends on the Planck response and the lag between atmosphere and ocean thermal equilibrium – against a background of large natural variability. The dynamic balance is between energy in from the sun and energy leaving the planet. 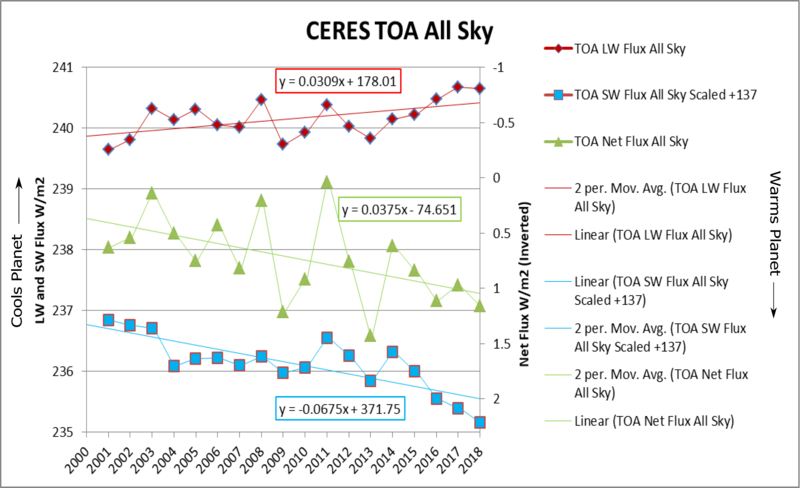 The cumulative sum of the difference in CERES shows a steadily increasing planetary energy content (red). There is an insurmountable calibration problem that is addressed with a ‘one-off’ adjustment to ocean warming rates – ocean warming being a best measure of energy imbalances. Argo temperatures (blue) are a more direct measure of planetary change. CERES anomalies do show the pattern of low cloud cover reduction – cooling in IR and warming in SW – dominating energy changes in feedbacks to SST. Although AGW is not the sole source of SST change – there is a component. I note that net is usually by convention shown as warming up. 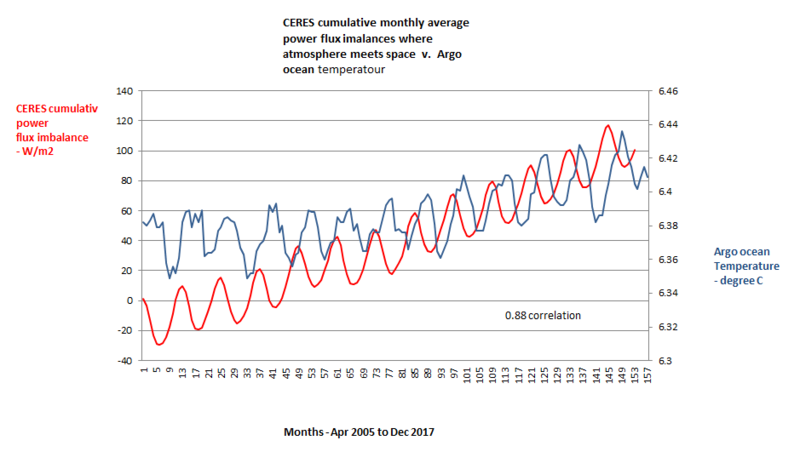 First chart – The red line identifies the undulation in retained energy within earths system (primarily the ocean) and the blue line the ARGO temperature detail. From the scale provided there is about a six-month delay in the ocean warming process recognized by the ARGO buoys. From the chart it looks like peak retention (red line) occurs about December (higher value) and least retention (lower value) occurs late April. There appears to be a steady systematic rhythm not dissimilar in style to the CO2 rhythm at Mauna Loa (example). 1. What is the month for the peak in the red curve? 2. Is the data in daily format if so, does the peak day vary much? 3. Same for minimum month red curve. What is interesting is that for the first few years the ARGO Buoy values had a degree on consistency, then the minimum rose more that the maximum until 2011 and then both values rose in concert. Unless there is something wrong with the data it took a few years for the Buoys to respond to the retained energy or ocean mixing changed. Importantly we do not have a clue what occurred prior to this. The buoys are free floating and influenced by currents, what is the chance that they would naturally find less resistance and have graduated to warmer currents? Where there is a repeating consistent rhythm there is a reason. The red line is cumulative average monthly energy imbalances at TOA. The variation is due to orbital eccentricity. Ocean heat must follow instantly. CERES has a ‘one off’ adjustment to an imbalance estimated from ocean heat. But according to Argo the imbalance changes. While agreeing with the broad principles of this energy imbalance work, I have major concerns about limitations of measurement technology. We have to do better than reliance on described adjustments because of the high reputations of the adjusters. What do your error measurement envelopes tell you? When they are provided, they give me apprehension. “The red line is cumulative average monthly energy imbalances at TOA. The variation is due to orbital eccentricity. Ocean heat must follow instantly”. “Ocean heat must follow instantly” There is theory and reality. The relationship between ocean convection / atmosphere interface and directional transport away is assumed to be 100% efficient 100% of the time. It is not and I have said this a number of times. The equilibrium relationship of retained energy in the ocean is subject to many years of correction. It is not chaotic as you suggest, it is very repetitive, time sensitive, hierarchical, interconnected and responsive,and very well documented in the existing data. You have it all sorted? Ein is in shortwave that penetrates oceans to 100 metres or more. There it is mixed deeper on turbulent eddies up to basin wide and 1000’s of metres deep. 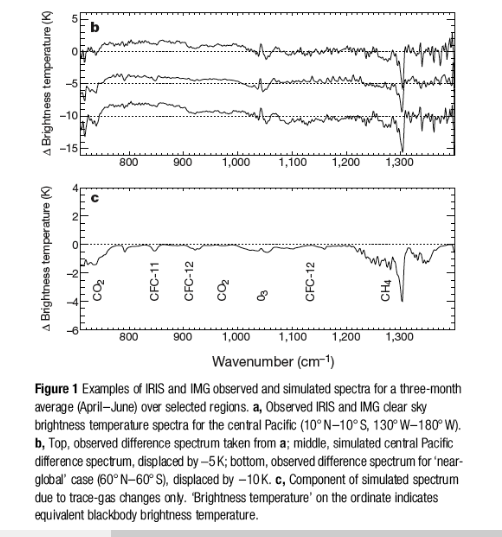 There hasn’t been any time in the satellite record when IR emitted didn’t increase. But let’s assume that Nicks impossible downward radiation from molecules emitting photons in all directions – including down – is a reality, Then IR increase at the surface penetrating mere microns reduces the temperature gradient across the skin. Holding in heat that is already in the oceans – from annual over-warming in eccentric insolation – as well as from the interior of the planet – rather that warming it over 1000’s of years with geologically slow models of Isopycnal mixing. I haven’t said it is chaotic for at least 10 minutes. I don’t know what you imagine chaos to be – but Earth fluid dynamics – including cyclones – is undoubtedly in an abruptly evolving state of spatio-temporal chaos. Regardless – there is no delay – or negligibly so – in energy entering oceans. Yes, the “EBAF” basically means that the whole system gets calibrated to their notion of ocean heat uptake, but that also means that ocean heat uptake cannot be the excuse for the lack of any reduction in LW radiation to space. The ocean done ate and still no reduction. CO2 can warm the ocean in a backhanded sort of way by warming the air over the water and reducing the temperature gradient, which is almost universally warm water to cold air. 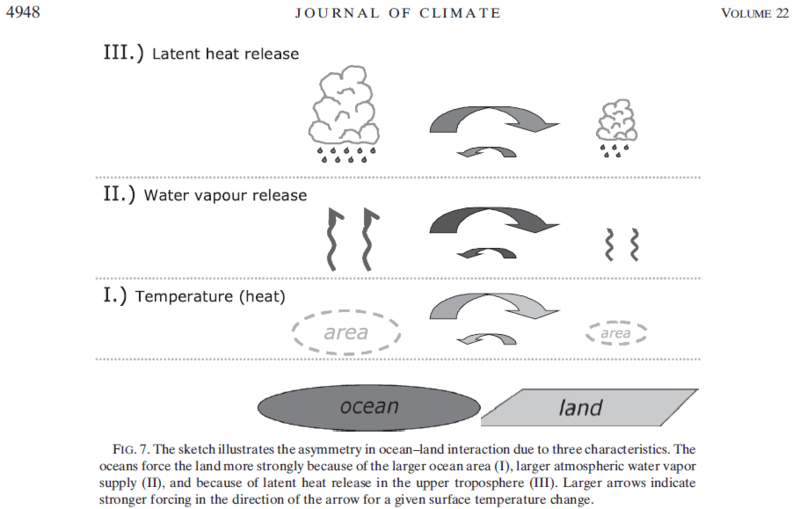 Energy must be conserved, so the ocean to atmosphere energy transfer being reduced by the lesser gradient gets debited from the atmosphere; a negative feedback. That leaves us with only the upward LW radiance from CO2 to space. What is black and white is that this is not decreasing as required for CO2 to be unilaterally warming the atmosphere. There is a one way flow of energy – from the sun to surfaces and into space. The Planck response drives the planet as it warms to an energy equilibrium – where energy out equals energy in. The lag to equilibrium is said to arise as ocean heat moves deeper by ‘eddy diffusion’ – a geologically slow process arising from the collapse of surface gravity waves. Hence an accumulating energy imbalance – heat in the pipeline – at TOA. As ideas go – this is high on my list of things to be skeptical of. decrease in cloud cover with positive feedback arctic ice loss? And there are decadal to millennial patterns of phase shifts. Although thinking in terms of static indices alone misses the dynamic interplay of forces producing the chaotic coupled ocean/atmosphere flow field. Such as in the 2017 north Atlantic tropical cyclone season. Meriodional patterns – more southerly penetration of cold polar fronts – are associated with low solar activity – e.g. Lockwood et al 2010. In this late interglacial period with a surface freshening of the North Atlantic and reduced AMOC – and a solar modulated more negative NAO – does this imply more positive AMO over the 21st century? On the other hand the gyre hypothesis suggests – with more negative polar annular modes – a resurgence of eastern Pacific upwelling. The latest Pacific Ocean climate shift in 1998/2001 is linked to increased flow in the north (Di Lorenzo et al, 2008) and the south (Roemmich et al, 2007, Qiu, Bo et al 2006) Pacific Ocean gyres. Roemmich et al (2007) suggest that mid-latitude gyres in all of the oceans are influenced by decadal variability in the Southern and Northern Annular Modes (SAM and NAM respectively) as wind driven currents in baroclinic oceans (Sverdrup, 1947). I don’t think hurricanes care about what causes the warming. Given that the 1986-2005 period includes a strong AMO warming, I’d bet on temperatures dropping below all the model projections when the AMO shifts cold in roughly 15 years. There should be another Atlantic ‘cold blob’ around SC25 maximum before then too. If rising greenhouse gas forcing projects onto natural variability, the model consensus is an increase in positive NAO/AO with rising GHG forcing. Which makes sense as that’s what stronger solar does. But increased positive NAO/AO is directly associated with a cooler AMO. Three of the four climate models used produced increasing damage with time, with the global warming signal emerging on time scales of 40, 113, and 170 years. 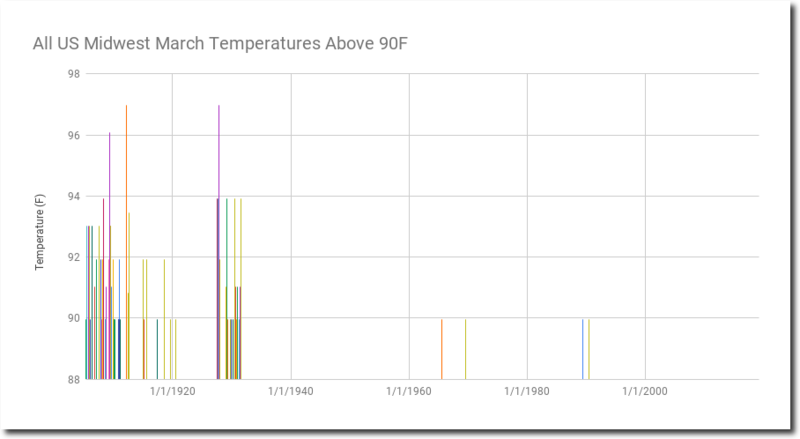 Everything happening now is unusual compared to what the global warming alarmists’ climate models (GCMs) predict–e.g., our children would never know snow again? That was supposed to have happened 10 years ago. What could as easily foresee, decades of global cooling ahead. In the real world we can’t even predict the weather accurately more than a few weeks out. let alone the climate 50-100 years out from now. In a digital world, however, as for the Left’s GCMs… it is obvious humanity and modernity have set fire to the globe and doom is near. Great series, Dr. Curry ! Any projected change in hurricane activity is expected to be small relative to the magnitude of interannual and decadal variability in hurricane activity, and is at least several decades away from being detected. Decadal variability of hurricane activity over the next several decades could provide much greater variability than the signal from global warming over the next century. I interpret this as saying that there high uncertainty in projections but best guess is that hurricane activity will have negligible impact on global GDP this century. This is consistent with FUND3.9 that project the global economic impact of storms to be 0.00% of global GDP at +3C GMST. Tropical cyclones produce a huge amount of damage, and set back GDP in developing countries by a decade. The damage will get worse because of increasing population and wealth in coastal regions. Little to nothing to do with AGW. The most significant damage to Puerto Rico from Maria happened before the storm- the island government’s refusal to maintain its electricity grid. Which means that paying attention to infrastructure is more important than banning pickup trucks to the future of hurricane prone places like PR. It also poses an interesting question- how resilient are windmills and rooftop solar panels to 130-mile-per-hour winds? You’d need a whole lot of concrete and steel to answer “very” to that question. Thank you Judith. I interpret your comment to be consistent with the FUND projection of 0.00% impact of storms on global GDP as a result +3C GMST. Part of the reason is that only 14% of global GDP is produced in FUND regions with population centroids south of 30N latitude. I linked Tol 2014 – and cost is sharply negative in the second half of the century. Even with the moderate ‘best guess’. Real world uncertainty is outside even CMIP ranges. sensible policy includes reducing methane, CFC’s and carbon dioxide. This a world away from where Peter Lang is coming from. No you did not. You linked to the Tol (2011) working paper. You didn’t look at Figure 3, and you clearly ignored or don’t understand the point. And if believe these numbers are not rubbery within broad limits – and that even with a moderate temperature best guess net costs do not increase sharply in the second half of the century – then we have yet another instance of skeptic motivated reasoning. The application of this analysis for policy is far from prescriptive – and far from head in the sand misinterpretation. It does suggest that rational policy responses are warranted. If you want to bring it solely back to highly uncertain storm costs – and opine do nothing on the basis that the world will be better off – you miss the point by a wide mark. Sensitive to ‘best guess’ global warming and broad data uncertainty but overwhelmingly negative past 2050. Most of the benefit last century was CO2 fertilization in agriculture – a dubious proposition. At any rate – there are better ways of doing it. Look at Tol (2013) Figure 3. The projected total negative impacts shown in Figure 2 are due to the projected negative energy impacts. These are not consistent with empirical data, which shows impacts of global warming on energy would be positive or negligible. In this case the total of all impacts is positive to about +4GMST from 1900. By reflecting away 30% of the incoming solar energy the atmosphere/albedo make the earth cooler than it would be without the atmosphere. Greenhouse theory has it wrong. Without the 396 W/m^2 upwelling there is no 333 W/m^2 GHG energy loop to “warm” the earth. These three points are what matter, all the rest is irrelevant noise. This yet again is all just immensely irrelevant – not to mention ill considered. The global first order differential energy equation can be written as the change in heat in oceans is approximately equal to energy in less energy out at the top of the atmosphere (TOA). By the first law of thermodynamics. How do Ein and Eout change? One way is with the fundamental quantum mechanics of IR interaction with greenhouse gases. Not been experimentally validated on a planetary scale? 1) the atmosphere cools the earth. 2) BB upwelling LWIR is not possible. 3) There is no “extra” energy for the GHGs to loopily “warm” anything. 1+ 2 + 3 = 0 GHE & 0 GHG warming & 0 man caused climate change. Clouds certainly reflect some sunlight – and oceans regulate global temperature. And the rest is fundamental. This is way off. I’m not sure why Judith Curry wrote this. I recently watched a New Orleans episode of Drugs Inc on Netflix. This is a great summary and worthy as a reference. the last phrase seems face-saving. Yes, higher SSTs would promote intensification, but only relative to a constant upper tropospheric temperatures. But upper warming is supposed to exceed SSTs by a lot. The 5% tag line also seems like face-saving from what is necessarily a speculative model, but even if that were accurate, 5% would appear to be in the noise – not even evident after a century. There’s a signature of satan dioxide if ever I saw it. Atlantic SSTs will warm dramatically during the 21st century ..
Well the North Atlantic SSTs have started the 21st century by moving in the opposite direction. I didn’t think tropical SSTs change that much anyway. Above 30 C heat is just shed to space by thunderstorms. Heat is lost from the earth to outer space by black sky radiation. Absolute zero is -459’F. If the average surface temperature of the earth is around 63’F a 1’F rise is an insignicant change in daily heat loss. Pingback: Weekly Climate and Energy News Roundup #352 | Watts Up With That?